If you take this attitude now, as time goes by you're going to find yourself completely isolated. You're going to want to hide your husband more and more and since you're always together, you're going to be in hiding as well. Our reader Donna asks Dr. Ruth. Q. I find myself trying to preserve my 63-year-old husband's dignity by NOT divulging information about his difficulties to our family and close friends. As I result, I am presenting a false front about how well we are doing. I almost feel like I'm leading two lives: the brave face that I wear in public and the tearful one this I often wear behind closed doors here at home. How do I go about reconciling this? A. While I understand your reaction, and in the case of some crises that one might face I would react the same way but you can't go down this road in the case of Alzheimer's. With Alzheimer's you know that the situation is going to progressively get worse. That your husband's mental facilities are going to fail is inevitable and it has nothing to do with dignity. It's not his fault, it's a disease. And since time isn't on your side you must use the time you have to prepare. There are many ways to prepare for the future that you are cutting off. Most importantly you aren't giving your family – his family- time to say goodbye while they still can. If you have grandchildren they need to spend as much time with their grandfather as possible now when they can still react to each other. If they're of a certain maturity they have to be told that grandpa is sick and that they have to make a priority of spending time with him. They may prefer to be with their friends but their friends will be there while their grandpa won't. And whatever their reaction now, believe me later on when they're older, they'll appreciate these moments they had with their grandfather. You want them to build up memories of what a great guy he is while he can still be that great guy. And you don't want to spring on them someone whose mind is no longer what it was. Better for them to see the gradual decline and get used to it. But you need to prepare too. You need to make plans of what you'll be doing in the future when taking care of him will become more of a burden. For example, now is the time to start looking at nursing homes not when you're all worn out and faced with the need to send him somewhere. Remember knowing your options doesn't mean you have to send him away but you have to be realistic that the time may come when there won't be a choice and that time won't be the best one to start looking. I list many other ways that you can prepare in my book. Please read it because I do think it will help you. The last point that I want to make here is that if you take this attitude now, as time goes by you're going to find yourself completely isolated. You're going to want to hide your husband more and more and since you're always together, you're going to be in hiding as well. Keep in mind, he might outlive you so that would mean the rest of your days would be spent in utter misery, almost as walled in by Alzheimer's as he will be. You can't let that happen. In her book Dr Ruth presents coping strategies for both the practical problems and emotional stresses of Alzheimer's care. 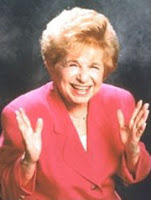 Dr. Ruth shows you how to avoid caregiver burnout; get effective support from family and friends; resolve family disputes; maintain your relationship with a spouse or parent with Alzheimer's; manage behavior; make your home safe; and deal effectively with doctors, care providers and facilities. 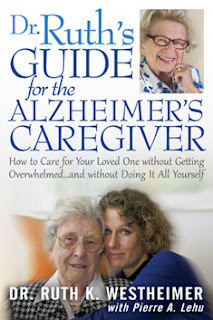 Note: Dr. Ruth has agreed to answer questions about Alzheimer's caregiving from readers in the Alzheimer's Reading Room. You should confine your question to problems associated with caregiving. If you have questions on medicine or medical treatments you should consult with your doctor. You can enter your question in the comments area below, and we will forward it to Dr. Ruth for her response.